One of the Melbourne's more enduring family-owned development companies has lodged plans for an 80-level city skyscraper, adding to the list of 43 proposals to be considered by whatever party forms government after this month's election. 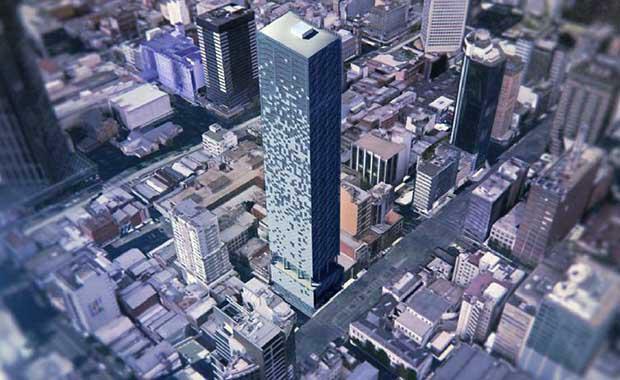 Local developer Brady Group, which has been building units in the city for more than 25 years, is banking on continued heat in the apartment market, submitting a proposal for a thin 220-metre tower on a relatively small 1290-square-metre site at 280 Queen Street. The three-storey rendered brick office building on the site partially leased to Kliger Partners Lawyers will be demolished to make way for a $150 million tower with a blue curtain wall finish and 589 apartments. The majority of dwellings - 287 - will have two bedrooms, with 242 one bedroom and 36 three bedroom apartments. The tower will also have 14 penthouses on its top levels. The property was purchased by Chinese national Xuebin Wu for $23.9 million last year. Mr Wu holds a third portion of the holding company, which lodged the plans for the site, suggesting an initial joint capital venture with, or buyout, by Brady. A Brady Group spokesman said Mr Wu was no longer involved in the project. "It will be a Brady Group development," he said. "Work will start in about 12 months. "The site formerly had a permit for a 57-level commercial building with ground floor retail that was issued in 2013.